Aluratek's AULS02F is perfect for providing a comfortable, customizable work surface for your laptop. 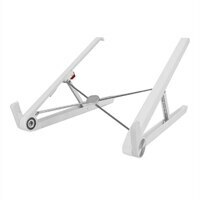 The laptop stand is designed to be light and compact while keep its durability. The stand features a smooth collapsible/foldable design and can easily slide into a backpack, purse, suitcase for transport. With its ergonomic design your laptop can be elevated to a more comfortable view to help ease body aches and eye strain. The stand provides solid stability and sturdiness for your laptop so you will never have to worry about them toppling over. The laptop stand's base features a non-slip silicone padded feet to keep it from slipping and sliding off your desk surface.